Any type can become the villain, especially when it comes to fantasy stories. Many of us end up favoring the villain in these stories, sometimes because they are misunderstood and other times because they are so good at being bad. 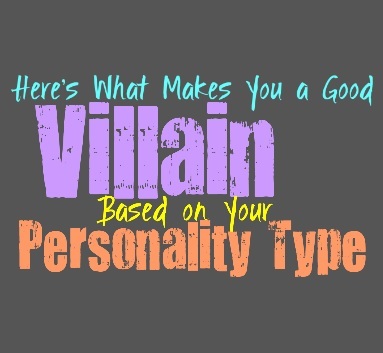 Here is what would make you such a great villain, based on your personality type. INFJs can often be portrayed as the villain, mostly because they have such intense inner beliefs. They hold onto their morals and what they feel is right, but this also makes them formidable villains. The INFJ villain is focused and strong-willed, and does not allow others to stand in their way. They believe in their goal and what they are doing, and this often comes from being wronged by someone. The INFJ villain has almost always encountered being hurt by many people, and it has pushed them over the edge. While INFJs are incredible and caring as heroes, they are terrifying as villains. ENFJs are often frightening as villains, since they have a goal that they believe very strongly in. ENFJs as heroes are caring and giving people who will do anything to protect others, but as villains they are a powerful force. The ENFJ villain has likely been deeply hurt by someone they trusted, to the point where they feel like there is no more reason to have faith in others. They have become a villain because they have been abandoned and shunned, and now they have distanced themselves from others. Often as villains they have a goal that seems to be for the greater good, but is a bit misguided. INFPs are rarely seen as villains, but when they are they can be difficult to come against. INFPs have powerful inner morals which they stand by and are extremely stubborn about. For most INFPs these morals lead them down the right path, but if something causes them to become skewed they will definitely make for formidable villains. They stand up for their inner beliefs, even if those beliefs can be rather intense and even against the hero. They are the villain with heart, even though their heart seems to be in wrong place. ENFPs as villains can be both intense and a bit over the top. They become obsessed with diving into their goals, even if they are skewed and troublesome. The ENFP villain is strong-willed and emotionally driven, using their heart to make their choices. They have strong inner morals and beliefs, but these morals often go against the actions of the heroes to the point where they feel the need to be drastic with their own actions. The ENFP villain can seem a bit crazy, and even all over the place- but ultimately they believe in what they are doing. INTJs as villains are goal-oriented and fierce, going after they want no matter what that means. They are already intense and focused people, who are more than capable of going making things happen. As the villain the INTJ is seen as calculating and powerful, and often is feared by everyone. They have a goal in mind that they believe in and will not allow others to stand in their way. Their drive combined with their intelligence definitely makes the INTJ villain a fearsome thing. ENTJs are strong-willed people who do whatever it takes to accomplish their goals, whatever they might be. They are not afraid to face challenges and will do anything to make sure they get the job done. As villains ENTJs are frightening to anyone who opposes them, since they are powerful and capable people. They know what they want and will enlist others to help them along the way, making them a force that is nearly impossible to come against. INTPs as villains are often the brainy ones, who come up with effective ways to take down their enemies without having to go out and do it. The INTP villain is fierce but silent, often they are someone others don’t even know. They might prefer to keep their villain identity a secret, knowing that it can be more effective to attack in ways that not everyone recognizes. The INTP villain is definitely capable and intense, and they aren’t afraid to go after what they want in a manner that takes down the hero of the story. ENTPs villains are often a bit zany and intense, their behavior might even seem a bit crazy to others. They do whatever they want and often have a strong rebellious personality. The ENTP villain often has their own goals, which break all of the rules and leave others needing to reign them in. This is often what turns them into the villain, these feelings of being restricted even when they’ve made their desire for freedom known to others. They discover a goal that often comes from the ignorance of those around them, and will do whatever they must to make their ideas known. The ISTJ villain is strict and focused, and will do whatever they can to obtain what they want. They often have an important goal in mind, and believe in their heart they are doing the right thing. The ISTJ villain won’t allow anything to stand in their way, and often has a well-crafted strategic plan. They won’t back down from a challenge and often have goals that come from their own inner morals. The ESTJ villain is frightening and intense, and will not allow others to stand in their way. They believe in what they are going after, and will obtain it in the most efficient way possible. They are good at crafting a strategic plan in order to get what they want, and they aren’t afraid of going after it. The ESTJ villain can seem calculating and cold, but will still be capable of getting others to join in their crusade. The ISFJ villain is often misguided, or has lost someone they care for. ISFJs are some of the types least likely to become a villain, but when they do they can be rather strong-willed. If they have a goal they believe in the ISFJ is often unstoppable, on top of that they are rather charming. They are good at hiding the fact that they are the villain, making others believe that their intentions are pure and that they won’t harm anyone. The ESFJ villain often has a goal that comes from heartbreak and loss, making them feel overwhelmed by their situation. They often are guided by revenge and a need to get even with the person who harmed their loved ones. The ESFJ villain can definitely be frightening and intense, especially since their goals are almost always because of love and a feeling of loss. The ISTP villain is often a bit intense, but they are also mysterious and charming. People are often drawn to them, without fully realizing that they are the villain of the story. Their goals are often more geared towards experimentation and experiencing whatever they want. They don’t like being held back, and so their morals often go out the door because of this. The ISTP villain is shady, but also very charming and even a bit seductive. The ESTP villain is both charming and mischievous, making them the villain everyone loves to hate. They are often lovable at times, even when they are doing the absolute worst thing. The ESTP villain often goes after a goal, and might even become bored with it quickly. They are often the villain simply because it is fun and they don’t want to feel held back by anything or anyone. The ISFP villain is guided by their emotions, which is often what takes them down the path they are on. Their emotions control them, and sometimes this means they are out for revenge of a loved one. The ISFP villain isn’t afraid of doing the dangerous thing, since they believe in what they are doing. The fact that they believe so deeply in their actions is a big reason why the ISFP villain is a force that is hard to match. The ESFP villain is often emotional and even a bit hard to understand. While most villains have rather strong goals, the ESFP simply wants to do their own thing. They ESFP villain often desires excitement and joy in the present moment, and sometimes this can lead to doing the wrong thing. They want to take control and be recognized by others, even if this means they have to do something completely insane in order to obtain this.